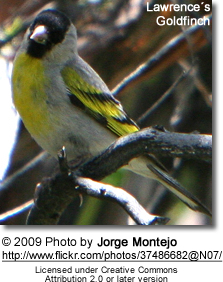 The Lawrence's Goldfinches(Carduelis lawrencei) are small songbirds found in southwestern North America. Both migratory and sedentary populations of the Lawrence's Goldfinches occur throughout their range. Most will leave the northern, central, and inland southern parts of California in winter. They may move into the coastal lowlands and into the lower parts of the southeastern California deserts. 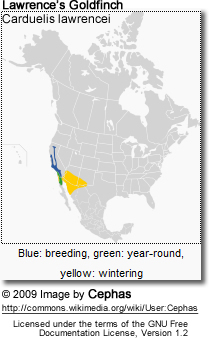 Others migrate eastward to the southern half of Arizona, southwestern New Mexico, and rarely to the area of El Paso, Texas (about Madrean sky islands region). Others move southeastward to northern Sonora and northwestern Chihuahua in Mexico. Outside the breeding season, these birds may frequent open habitats, such as parks, residential gardens or deserts. Non-breeding often join mixed-species foraging flocks of less than 50 birds. On occasion, as many as 500 of them have congregate at favorite feeding sites. 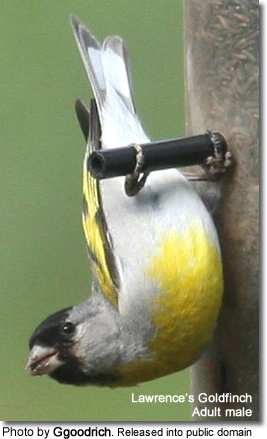 Male: Paler plumage with larger areas of brighter yellow. Black cap and face. Females: Browner plumage. Less and duller yellow plumage details. No black cap or face. Most nesting occurs from early spring to early to late summer. They nest in dry and open woods - often near brushy areas. Nests are typically within 1 mile (0.8 km) of bodies of water. The loosely woven cup nest is constructed by the female alone and situated in the fork of trees (often mistletoe, Western Sycamore, oaks, etc.) - about 10 feet (3 m) up near the edge of the tree. Males join small flocks while females are on the nest. The female lays and incubated 3 to 6 white, blue or green-tinged eggs for about 12 to 13 days to hatching. For the first four or five days after hatching, the female remains with the chicks and the male brings food to the nest to feed the female and the young. Later, the female will also gather food and help feed the chicks. The young fledge when they are about 13 to 14 days old, but remain with their parents for another 5 to 7 days. At garden feeders, they are particularly fond of niger seed (Guizotia abyssinica). They will also eat the berries of mistletoe (Phoradendron) and Coffeeberry or California Buckthorn (Rhamnus californica).